Warning: there follows a pretty exhaustive account of the 2016 Vedanta AGM on Friday 5 August. It was a LONG AGM and this account is consequently also LONG. If you want a much shorter account of the AGM itself, see A Tale of Two Worlds. 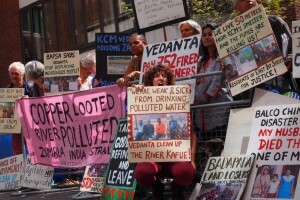 For an account of the protest outside the AGM and around the world, see India, Zambia, London protest Vedanta’s AGM. This year’s Vedanta AGM was a particularly lengthy one. Outside, a noisy and colourful protest raged. Inside, Deepak Kumar introduced the meeting, going in to immense detail for around ten minutes over the instructions for use of the handset provided for voting. We were already bored half to death before the business began. Chairman Anil Agarwal then began a lengthy speech. Agarwal said he believes the worst of the commodities downturn is behind us. The company has generated strong cash-flow and reduced net debt. It is an exciting time for the Indian economy, which will drive demand for commodities worldwide. New mining legislation in India will encourage the industry and attract more investment. Prime Minister Modi’s government is spearheading a revolution in industry, with the fastest growing economy in the world. Vedanta offers investors a way to share in India’s success story. Indian Prime Minister Modi recently visited South Africa and Agarwal was part of the accompanying business delegation. Vedanta contributes significantly to South Africa. During the visit he announced local partnerships, using South African expertise to benefit Vedanta’s mining operations. Zambia’s economic performance is likely to remain strong, and Vedanta is a major copper producer there. Agarwal also announced that $30 million were to be devoted to its in-house research and development programme. The company prioritises community development, safety and corporate social responsibility. It affects 2.25 million people around the world. It is a great benefactor to women in India. It will build 4000 centres across country for women and children, for education and healthcare. Its social impact programme is the first of its kind. Its recent sustainable development day for investors showed them the company’s aim for zero harm and zero discharge. Agarwal announced that Euan Macdonald of the Sustainable Development and Remuneration Committees is retiring soon, and this was his last AGM. He has contributed to improved safety and sustainable development. Katya Zotova will take over his role on the Sustainable Development Committee. By this time even some of the directors appeared to be nodding off. Chief Executive Officer (CEO) Tom Albanese then began his presentation – and this one was accompanied by slides! How exciting! This was his third AGM since joining Vedanta. Each year he is more encouraged by progress. The company is delivering value sustainably. When he became CEO he made it clear that they want zero harm on worker safety. More hours of safety training than ever before have been provided this year. This includes contractors as well as employees. He sees a shift in the approach to safety, but is saddened by 12 fatalities last year. Full investigations are being undertaken. It will take time to put a proper safety culture into place. Albanese agreed with Agarwal that the worst of the commodities market downturn is behind us. For the first time in more than five years most commodities will end the calendar year higher than at the beginning. He said that Vedanta has reduced its net debt, he said, by $1.1 billion. The best way to deliver financially is to focus on excellent operational performance. The company owns long-life, low cost assets – and benefits are coming through as it increases production. It is operationalising its whole energy assets (business-speak really is a load of utter gobbledegook, isn’t it?). Zinc is the strongest performing metal, and Vedanta has the single best zinc asset in world at Hindustan Zinc. He said that the Board is looking to simplify the group structure through the merger of Vedanta Limited with Cairn India. The strategic rationale for the merger is compelling – diversified companies deliver higher returns. He said that Vedanta contributed $4.5 billion dollars to public finances in taxes and social security payments around the world during the past year. It is working for transparency in taxes. Its Sustainability Report covers the company’s environmental and social efforts. It recycles 23 per cent of the water used across its operations. It increased its saving of water. It is using more renewable energy in its operations and reducing energy use. Technology and innovation are at the heart of its sustainability efforts. It partnered with IUCN (International Union for the Conservation of Nature) to develop a biodiversity project at Gamsberg. It completed mine closure at Lisheen in Ireland, where it has undertaken active partnerships with local green businesses. The company intends to prioritise human rights, Free Prior Informed Consent and local culture in order to ensure its social licence to operate. Finally, he noted that, according to the Confederation of Indian Industry Vedanta is at the forefront of environmental social and governance practices in India. Poor India! Chairman Agarwal then invited questions from the floor – and there were lots of them. Cecil Gutzmore congratulated the board for the excellence of their presentations but noted that the company’s report talks about working together and pointed out that there are people that they are working against. Cecil pointed out that this attitude not limited to KCM. Claimants had been granted compensation in three other locations and are still awaiting payment. Could the board confirm whether obstructing legal procedures and delaying payment remain company policy? In Namibia, Ghana, Liberia and South Africa, similar problems are in evidence. The question is whether these problematic practices continue to be the company’s policy. Tom Albanese replied that he had a lot of respect for legal processes (just as well!) so he took Cecil’s comments seriously. He said that the 2014 case referred to was a commercial case which was settled amicably last year. In the process of the resolution of any commercial litigation tensions develop which have to be worked through, and it is the job of management and the board to solve problems and Vedanta satisfied the other party. In Zambia, the case was currently being heard in the UK and Zambia. The company had to recognise that the court will go through its own process but the case will be appealed and heard next year. Vedanta’s position is that the Zambian courts are fully capable of hearing a case like this. Anil Agarawal concluded the matter by stating, “We will follow all the procedures. The matter is sub judice. We are absolutely transparent and whatever judgement comes in we will follow it.” That would certainly be welcome. As our friend Simon noted later in the AGM, there are questions over the extent to which Vedanta has respected previous court judgements. Olivier Salas, representing campaigning organisation ShareAction, asked how the company reports on risks from waste management. He said its Sustainable Development Report mentions risk management but he understood from a Guardian report(1) from 2015 that Vedanta had contracted SNC Lavalin to investigate pollution of streams and failure to manage harmful impacts of its operations in Zambia. Vedanta was already facing legal challenges from communities suffering from polluted water. The SNC Lavalin report had already been leaked to the media so the board should release it and its recommendations to shareholders and should explain progress made on the issues and how it all fits in with the company’s water management policies. Tom Albanese replied that KCM had been in operation for 70 years, so its beginnings pre-date Vedanta’s 12 year involvement and even pre-date Zambian independence. Vedanta recognises the legacy of pollution and has spent a lot of money to mitigate it and improve the situation. Albanese said that he had asked about the SNC Lavalin report after it had been published in the Guardian as he had never seen it, nor had any other member of the board, and it seems that the only copy had gone to the Guardian newspaper. I am surprised that this statement was not taken up: it seems extraordinary that a report contracted by Vedanta was not available to the company even after being leaked to the Guardian. I felt we may be slipping again into a world of Magical Realism. Rumana Hashema, a post-doctoral researcher from Bangladesh and spokesperson for the Phulbari Solidarity Group, said that she was working closely with community groups protesting against Vedanta. She said that the Chairman and CEO had talked about doing zero harm whereas they had all seen how people and community representatives from various countries had been crying out about the damaging impacts of the company. She said that she would like to know how the board would respond to the protesters outside. Rumana said she was shocked by the way the board’s presentations had totally overlooked the issues raised in the 27 May 27 judgement in the case of Dominic Liswaniso Lungowe versus Vedanta Resources and KCM in London, which Cecil had just mentioned. This judgement by Justice Coulson had been a major challenge to Vedanta’s ongoing abuse and misconduct across Zambia, and big news for the company which the shareholders should be made aware of. Rumana had been reading about this judgement for the last two months as it became important news in London. How was it possible for the Chairman and CEO to overlook the matter in your whole 30 minutes long presentation? Was this how they could avoid doing harm and abuse to communities? Tom Albanese replied that when he made a public statement he was making a statement on behalf of the board and is personally liable for it under the law in both the UK and Zambia. He continued, “What I say, I say with assurance: we produce and provide transparent financial reports for our operations in Zambia and submit them to the Ministry of Mines and publish a summary in the newspaper, and if you want to see them you can apply to the government and they will send them.” He said that the other shareholder in KCM’s operations is government-owned ZCCM, so on the board of KCM there are people who represent ZCCM and the government of Zambia. Everything is disclosed. He said he is under a requirement to comply with the law and tell truth about what the company is doing. Rumana asked whether he really thought the company was doing zero harm. “Because there is money to be made!” replied Cecil Gutzmore from the floor. Rumana answered, “Mr Chariman I appreciate your wish to do no harm but you are aware that you have already done harms to people. You are saying that you want to reach zero harm after doing so much damage and abuse to people. You are saying that you want to stay for another five years but people don’t want you for another year, they don’t even want you for a day there. You have seen the outcry of people outside the AGM. They are saying that they want to kick Vedanta out today. They don’t want you there because of the harms that you have already done to them. Councillor Richard Greening, representing the Local Authority Pension Fund Forum (LAPFF), said that thirteen LAPFF members hold Vedanta stock. LAPFF had previously held productive discussions with the company over human rights but it remained concerned about continuing allegations of air and water pollution and legal actions in Zambia. There are financial and reputational consequences for the company. Many issues may relate to the time before Vedanta owned KCM but it raises the question for LAPFF about a possible underlying problem with the company’s approach to risk assessment. It is good that Vedanta undertakes to maintain the life of the asset and local employment but is clear from press articles that there is very severe pollution from copper sulphate and clearly several people have e damaged by this pollution. The Chairman and CEO had described the things being done to mitigate this but did they have the right processes when you looking at acquisitions? Is risk management up to the task of properly assessing problems and how to address them? Everyone wants to see a clear and effective plan to remove pollution at KCM, including pollution dating from before Vedanta’s involvement. “We ought to get ourselves into a position where the pollution is history,” he concluded. Tom Albanese said that he had talked about environmental matters but that Richard Greening had raised the important issue of governance and risk. The whole global financial sector in 2008 had a shock and had overhauled risk management. People have changing expectations. In 2002, the notion of community and social licence to operate did not exist. Only a few years ago, Free Prior Informed Consent was on the drawing board and not a formal policy. Vedanta had formalised a better risk management process involving members of the board. Each project has a risk management committee which evaluates risks according to magnitude and probability and looks into how to mitigate them. Larger risks and externalities are considered including the larger issue of carbon emissions. The audit committee reviews risks, and management assurance people are involved. In addition, the company had made a very strong effort to look at historical legacies. It is the board’s responsibility to look at capital allocation, and as management they had to provide robust risk management and due diligence processes. He said that Mr Greening could see from the company’s results that it is very focussed. Film-maker Simon Chambers said that he had been asking at Vedanta AGMs for many years about the Korba chimney disaster. He would not ask today because he had been promised time and time again that there would be information and that Vedanta would do an investigation. Simon said that Tom Albanese was misrepresenting reality. “Is your perception so different from other people’s, or do you know what is going on and are lying about it?” he asked. He said that the Chairman should find a new CEO. Mr Albanese had said that there was a full investigation into the deaths. But whenever Simon had asked about the deaths, he had been told that an investigation was being carried out and that nothing could be said until it reported. Simon had asked two years ago why Vendanta’s lawyers had suppressed a legal report into the Korba disaster, and there had been no further reports issued since, just outstanding court cases. Anil Agarwal said that TomAlbanese would stand by what he said and that there was no question that Vedanta had the highest regard for the CEO’s truthfulness. He went on, “I have full trust and full belief in him and the company is very fortunate to work with him, and he has rebalanced the governance of the company.” Regarding the Korba operation, this was controlled by Balco, a company with its own board and AGM. It is controlled by Vedanta Limited, which also has its own board and its own shareholders and conducts business transparently. On top of that comes Vedanta plc. “India is a democratic country,” he added, though I was unsure of the relevance of the remark. “We will go back to Balco,” he said, “and say it is very unfortunate what happened with the chimney, absolutely unfortunate. We follow the law. We can afford to pay compensation of each and every victim. I do not believe that Balco management would not pay compensation.” He said that a full legal team is involved in the investigation and the board will go back to them again and ask them to look into the matter. “Please understand that Balco on top of Vedanta is its own company and everywhere investigation is taking place. We will take this matter to Balco again and ask them to look into this matter,” he said. Another shareholder said that he had been listening to the ‘dialogues’ at the AGM and that they were not really questions and answers. Shareholders could have dialogues with the board elsewhere. People were at the AGM to ask questions on the annual report, and if people were not happy, they should present their views elsewhere, not at the AGM. and what I share with all the rest. I am afraid this hymn had a rather profound impact on my spiritual and political development and hobbled me with an inability to grasp how a human being can listen to a catalogue of suffering and destruction caused by his investments and still be concerned only about how much money he is extracting from them. But it takes all sorts to make a world, doesn’t it? The shareholder concluded his remarks by saying that a lot of shareholders had left the AGM because they get bored hearing about these issues when they want to hear about how their investment is going. There were cries of “Shame! Shame!” (though not from me – I was too busy taking notes). The Chairman of the Remuneration Committee attempted an explanation of the size of Mr Albanese’s bonus, but it did not satisfy the shareholder. He asked further about the share price reduction, and Tom Albanese answered, but I failed to register it. Another shareholder observed that a lot had been said about problems and challenges, but “we have gone through one of the worst years for the mining industry but most experts agree that we are at bottom. Vedanta has tier one and assets and tier one management,” he opined. He asked whether there was a target for reducing debt within three or five years? (I don’t know why he didn’t mention four. It reminded me of the Holy Hand Grenade episode in Monty Python and the Holy Grail.) What level did the board think would be acceptable? With regard to the merger with Cairn India, would the outstanding tax issue affect the timetable envisaged, and is the board contemplating taking over any possible liability that Cairn Energy may have with regard to tax? Anil Agarwal, clearly delighted to be asked about money, replied that the debt level was “comfortable compared to our peers” (it sounded like a form of supportive underwear popular in the House of Lords) but that Vedanta had a target of reducing debt. With regard to tax liability, Cairn plc was working on arbitration with the government, and Agarwal believed it would all soon be resolved: “We will not be affected by retrospective tax, as that is between Cairn plc and the government. Mining researcher Roger Moody stood to ask a question and the Chairman exclaimed, “Ah, it is our old friend!” Roger retorted, “I may be old, but possibly not a friend.” He went on, “I am glad that the CEO put you in your place for saying that Balco is not directly governed by the ethics of the Vedanta corporation in the context both of the huge disaster at the Korba plant in 2009 and in terms of the continuing small disasters affecting thousands of people at the Bodai Daldali mine.” He asked Mr Agarwal if he had seen the film about the mine put on You Tube in February. Roger said that seven years ago he had asked about bauxite operations in Chhattisgarh, including the fact that children were working in the mine. The reply had been that Mr Agarwal needed to check. Roger explained that he had visited the Bodai Daldali mine with a film-maker colleague and made the film in February of this year. The mine is peculiarly dangerous. Roger had returned two weeks ago. An Indian journalist had visited shortly afterwards. In February, Roger and his colleague had been able to enter the mine and had free movement around the whole site On the more recent visit, with an Indian companion working for Dalit rights in state of Chhattisgarh, they had been stopped at the entrance to the site. Permission had to be obtained from the Corporate Affairs Office. Roger and his companion had left the site not having checked whether conditions were the same as in February. He had explained that he would be at the AGM to report back and that he would stop and interview workers returning from the site. Those recordings will be available soon. Roger said that conditions did not appear to have changed much expect that women have been told they should wear helmets. One interviewee was a village elder who said there had been a serious accident with a woman slipping and breaking her leg as she tried to load a lorry. Working conditions, lack of benefits and lack of medical care appeared not to have materially changed. In preparation for Vedanta’s own corporate video showing the Bodai Daldali mine, in anticipation of the filming, workers told Roger and his colleague that they were told not to turn up for work that day. Samarendra Das of Foil Vedanta said that there had been a big protest in Niyamgiri (in Orissa/Odisha, in India) and they had raised serious issues for Vedanta to address. Students from Niyamgiri had said that wherever the company operates, massive human rights abuses are taking place. Opponents of the company had been put in prison or brutally murdered. There had been massive militarisation where the company operates. There had been a statement in the press saying that the company would lobby for mining in the Niyamgiri hills, despite the expressed opposition of the people. What was the company’s current stance on mining in Niyamgiri? Samarendra then said he had spent a month and a half in Zambia. He said there were people living next to the company’s polluting smelter, and that some having were serious health problems. He had spoken with the President of Zambia for 40 minutes about what the company is doing in Zambia. “People gave us statements in writing and on You Tube, “ he continued. “People cannot walk, some cannot raise their feet. There is ongoing malnutrition. I shared your CSR report with villagers and they told me that the report was not true. Villagers had not all been given cows, only a few people had been. Someone is quoted who does not exist in the village. How can you make claims in your reports and not give the report to villagers, who deny them?” He said that villagers were suffering from pollution caused by the smelter. There was a lack of warnings about problems. Villagers had asked Samarendra to raise these questions and he would also put them to the new President of Zambia after the change. The company was polluting rivers in India and Zambia and failed to address the problem. Samarendra added that in 2003 the company had placed an advert for the position of Manager of the refinery at Lanjigarh saying it had secured rights to build the refinery before it had in fact secured the right to build it; and it had never given up hope of mining Niyamgiri. Anil Agarwal replied that in 2003 the company did have the right to mine Niyamgiri. What was Samarendra’s concern? Samarendra said that people there were neither living in peace nor receiving justice, despite the company’s stated intentions. The company claimed it had spent $37 million at Nchanga, but villagers had seen none of it. “They say they have been living in hell for the last eleven years. You have let these people down,” he said. Anil Agarwal replied that, with regard to Niyamgiri, Vedanta had not taken anything out of there, it had given back the mine to the government, and the government had control of that mine. He said that the company was talking with the government about other mines, other bauxite, but this mine was with the government. Regarding the job advertisement in 2003, if Samarendra would like to give him something in writing, he would find out. Shareholders would get bored to hear about an advert in the newspaper in 2003. Regarding Zambia, the mine had been there for 60 years, the smelter for 30/40 years. All the gas was going through the chimney. When the smelter was built all the sulphur went into the air. Seven years back Vedanta had built a brand new smelter with the best modern technology and shut down the old smelter because it was throwing sulphur into the air. Vedanta had invested $1.4 billion. It was now a world class smelter. Tom Albanese said that the company had seen Samarendra’s materials a year ago and had been taking action. He had not heard about the request for relocation. Samarendra replied that they had told local management but perhaps Mr Albanese had not heard of it. Tom Albanese said he would look into this. Rumana Hashem rose to speak again. Rumana said that if he wished to flirt, he would have to flirt with an old woman. She continued, “You have claimed that you will respect the decision of the people who rejected the mine, yet the new Mines Minister, Piyush Goyal, has been making statements about pushing the project through. What are your intentions regarding the Niyamgiri mine? 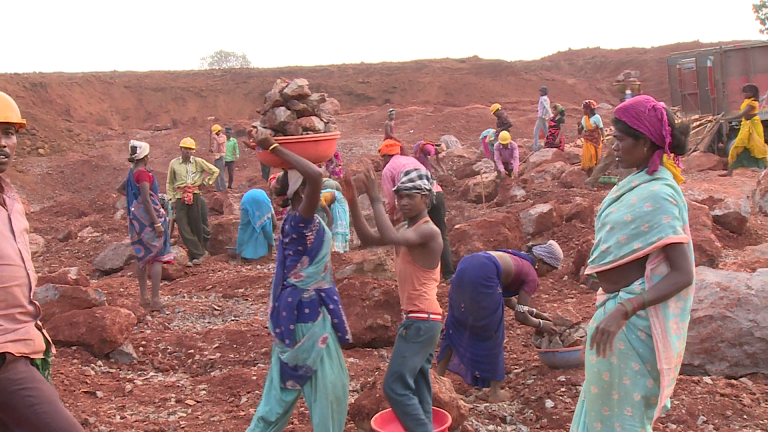 Are you still lobbying the Odisha government to overrule the democratic decision and force the mine through? When will you close down Lanjigarh refinery which has now been operating at a loss for too long due to lack of raw material? Rumana continued, “I would now like to respond to a senior shareholder who appeared to have been advocating for an ill process to be practised in the Annual General Meeting of the company. The shareholder behind me has said we should only raise questions based on the Annual Report produced and distributed by the company executives. He suggested that we should not comment on anything else, and that any discussion beyond the Annual Report should be discussed outside the AGM and in private. He thought that we were having a dialogue with you which he suggested to do in private. He also claimed that shareholders were bored by many questions that some of us have been raising in the AGM today. “I would like to object to his suggestions. I think that we should develop appropriate ethos that enables an environment to discuss complicated issues and complex truth openly. Multinational corporations must practice transparency and the Vedanta board should be accountable to all shareholders rather than only producing an Annual Report distributed to us. The company should follow ‘good’ corporate ‘ethics’ which would allow space for any discussion related to the company to take place in the same room where the AGM is taking place so that all shareholders and people involved in the company can be aware of what is happening in reality. “The shareholder who found our questions and comments are ‘dialogues between you (the board) and us (as community representatives) is wrong. We are not here for a dialogue with you. We are here to report the abuse that your company has done to people in various countries. We are here to place oral complaints on behalf of the communities. We are here to question you about why you are overlooking these important issues. There is nothing to get bored about. The shareholder who complained that other shareholders have left the room because they were bored by our allegations against the company did not notice that two people behind me left the meeting during his speech. I have an eye witness here [indicating the security guard/peer who sat in front of her] who noticed this and exchanged a smile with me as the shareholder appeared mistaken. The shareholder being referred to stood and interrupted Rumana at this point with shouts, pointing at her disapprovingly. He was asked by board members to allow her to finish her remarks. Tom Albanese and Anil Agarwal said that they wanted to continue the practice of discussing things openly in the AGM. Mining researcher Richard Harkinson noted that in its Annual Report the company said that its “Entire power portfolio of 9 GW [or 9000 MW] is now operating” [p02]. Despite references to hydro power by the CEO during his speech, Richard noted that this is basically coal-generated power, although Tom Albanese had stated that the company was also considering burning oil to increase power generation in Zambia. Richard said that a coalition of investors called Aiming for A had been engaging with larger mining companies asking for more transparency and better reporting on carbon emissions. Vedanta had coal concentrated in India and its 9GW power output was the equivalent of a small developing country. It seemed that the company did not even have a ‘supercritical’ (2) plant, so how did it meet investors’ and others’ concerns about increasing carbon emissions? Tom Albanese replied that the company was “very conscious of the shift in sentiment about the effects of carbon on the world’s climate.” It also recognised that in the Indian government there was a recognition that responses are different in a poor country. He said that Vedanta’s largest plant, in Rajasthan, is supercritical. Most of the company’s plants are Chinese and superior to European and American plants. Richard asked, “Why hasn’t Vedanta Resources included in its latest annual report and financial statements as a contingency (3) what has been referred to by Cecil Gutzmore and what you’ve agreed represents simultaneous litigation in the UK and in Zambia by people affected by the pollution of the Kafue River caused by your operation in Zambia? You have been defeated in the UK courts on your arguments against forum here, and so there is a real threat to shareholders’ interests in a court judgement with damages. You are continuing to pollute the Kafue river, you are facing litigation, and I don’t think you are making provision for losing litigation. Richard noted that the company reported impairments (4) or write-downs in asset values of almost $5 billion, most of this being with oil. How did it measure impairment of its copper assets, particularly in Zambia? Tom Albanese said the company had no impairments in copper. What’s happening to the water? Tom Albanese replied that Nchanga was closed. There had been less than five years of resource left when Vedanta took over mine but 350 people were still working on care and maintenance and dewatering, and the company wants to rehire when the moment is right. The company was losing 7000 kwacha per tonne of production there. At Vedanta’s last two AGMs slides had been shown demonstrating a significant reduction of suspended solids going into the Kafue River. The company reports to the government on solids going into the river as Vedanta recognises its importance to agriculture. The company had increased its use of tailings to recapture metal. Richard said that Vedanta had stated [p79] that it is the company’s priority to build a ‘reliable tailings leach facility’. How did the company manage a leach site near the Kafue River which leaks, as most leaching plants do, through seepage? How did the company manage waste water treatment? What clean-up standards did it seek to use and to comply with, and what independent verification of testing results did it have? Tom Albanese replied that tailings were heated to improve the yield. He said that Richard had seen the video shown two years ago about how clean the mine’s water discharges in to the Kafue river are. The company treats waste water to Zambian standards before discharging and we report testing results to the Government of Zambia. After this, Anil Agarwal invited people to vote (as laboriously explained by Deepak Kumar at the beginning) and pronounced the AGM closed. And then it was all over, bar the shouting. That continued outside as protesters gave a noisy reception to the company’s board as they left the building. 3 UK publicly-listed companies must record in their annual financial statements explanation of commitments, guarantees and contingencies. See section 38 of Vedanta’s 2016 Sustainable Development Report at http://sustainabledevelopment.vedantaresources.com. As an example of a guarantee, Vedanta paid $75 million dividends to Anil Agarwal’s holding company Volcan, and provided a $17.3 million guarantee against the Government of India’s continuing tax disputes with Volcan. 4 Vedanta’s impairments: in section 38 of its Annual Report, Vedanta recorded ongoing disputed levies in Tamil Nadu, Rajasthan, Orissa and Chhattisgarh; elliptical accounts of disputes with the Indian Revenue which centre on its acquisition chain from Mitsui of Sesa Goa Iron Ore via their subsidiaries Richter, Westglobe and Finsider, and the Government of India’s retrospective legislation to charge withholding tax on capital gains. See http://profit.ndtv.com/news/corporates/article-retrospective-tax-5-deals-in-litigation-over-capital-gains-305295. Vedanta has a similar dispute about its Cairn India acquisition. Both of these they expect to win. See http://www.corpwatch.org/article.php?id=16084. Other disputes concern contractor claims over thermal power plant building at Jharsuguda, and with Punjab State Power Corp. Then there are various large-scale sales taxation disputes totalling $1.1 billion, for which Vedanta considers that it can mitigate risks.